Partnering with parents to raise a community of readers. The Youth Services Room is the place to go for books, audio books, videos, DVDs, CDs, read along kits and other materials that can help children develop reading skills as well as a love of reading. Use the following suggestions to make your child's visit to the Library both entertaining and educational. Build vocabulary by talking with your child about the seasonal displays in the portal. Even if your child is not yet talking, you can hold a conversation by asking questions and then answering them for your child. (Would you like to a grow a flower like this? Maybe we can plant a daisy in our backyard.) The quality of a child's vocabulary is a prime predictor of school success. Take every opportunity while in the Youth Room to introduce your child to new words and to use them in sentences. Communicate with young children through the Whisper Tube in the portal. When you speak into the tube, sound waves are trapped inside, vibrate through the tube, and are channeled through to the other end. 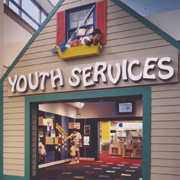 A larger Whisper Tube is located within the Youth Services Room for older children to take part in the experience. Develop basic thinking skills like matching, ordering, patterning and counting by using the games and activities inside the portal. Give your child enough time to explore this area as part of every library visit. Encourage gross motor skill development. As your child hops from one lighted square to the next, she develops gross motor skills and color recognition. Continue identifying colors and shapes throughout the Youth Services Room (find swirl designs in the carpet; are the colors of the swirls the same or different?). The Inspire is an oversized, interactive, multi-player, educational media device used in our library. The Inspire is engaging, easy-to-use, promotes interactions among children, facilitates a social learning environment, highlights natural curiosity and creativity of children. The Inspire encourages children’s fine motor skills, speaking, number recognition, alphabet recognition, observation skills, classifying, patterns, prediction, ability to problem solving, and counting skills. Develop language skills. Recite Mother Goose rhymes as you look at the Mother Goose Mural and look for twenty nursery rhyme tiles hidden throughout the Youth Services Room. Identify and recite the rhyme for the tiles depicted. Listening to rhymes helps children hear the same and different sounds that make up rhyming words. Promote Cognitive Growth through play with the bead mazes and puzzles. These will help develop hand-eye coordination as well as finger and hand muscles that will be needed later for writing. Help your child write his name and other familiar words using magnetic letters on the magnet tree. Encourage creativity and language development. Use the puppet stage and puppets under the Reading Tree for dramatic play. Make believe, pretend conversations, role playing and other creative expression help children learn grammar and vocabulary and understand abstractions (such as a lion puppet symbolizing the actual animal). Dramatic play also helps children to become storytellers as they use puppets to narrate daily activities (taking a bath, baking cookies) and to think in terms of a sequence of events. Start early nurturing a love of reading. Board books are perfect for introducing babies to books. Point to the pictures and talk with excitement about what is on the page. Stretch your child's reading skills. Easy Readers use controlled vocabulary, large print, and fewer words per page - just what your beginning reader needs! To help locate materials for your beginning reader, easy readers are organized into four different groups: White (Pre-Emergent) Easiest beginning reader. They have few words, large print, and large pictures. Orange (Emergent) Print size and spacing are still exaggerated with more print than pre-emergent readers (may have up to 8 lines). Green (Early Fluent) These books have smaller print, fewer pictures, and more advanced vocabulary than earlier readers. Blue (Fluent) Beginning chapter books such as Henry and Mudge, Nate the Great, and Poppleton. Encourage active learning. Engage your child while reading by asking open-ended questions about the illustrations and photos in picture books. Ask her to predict what will happen next. Ask how she thinks the characters in the story are feeling. Ask her to relate the events in the story to her own life. ("Where have you seen a bear?" "What would you do if you woke up and saw three bears in our house?") Repeat your child's statements in complete sentences to develop her understanding of sentence structure. Have your child turn the pages while you point to the words you are reading. Demonstrate for your child how books "work," such as reading from front to back and from left to right. Don't be discouraged if your child wants to read the same book again and again. Encourage your child to "pretend read" a favorite story. Point out and read letters in picture books and on signs in the Youth Services Room to further develop letter knowledge. Children's proficiency in letter naming is a well-established predictor of reading success. Start with more easily visualized upper case letters, introducing just a few letters at a time enhances mastery. Stimulate your child's interest in reading and learning. Attend programs for all ages in the Activity Center and enjoy creative play when the room is free. Toys in the room are selected because they are safe, educational and developmentally appropriate. Library programs introduce a variety of literature, songs, rhymes and games. Participating in programs helps children develop fine and gross motor skills, social skills and intellectual skills while in the reassuring presence of their adult caregiver. Use creative play and toys to help children develop basic skills such as matching, ordering (put people in order from smallest to largest), patterning (use vehicles to create a color pattern), reversibility (build a block tower; tear it down and start over) and counting and sharing. Read to your child in a relaxed, casual environment. Take the reading experience outdoors on the terrace outside of the Youth Services Room. Develop reading, math and thinking skills using educational apps and Internet sites. Apps have been selected for the iPads with developmentally appropriate materials to aid in your child's literacy development. Use the second chair and headset provided at each workstation to comfortably supervise your child's activities and to take part in the experience yourself. Appropriate websites for children can be found in our special library prepared homepage for children called "WB-Buzz." Just for Me When I'm Zero to Three! The colors, textures and shapes integrated into the Learningscape provide endless opportunities for babies and toddlers to explore and learn about their world. Use this learning zone to help young children stimulate their developing brain, encourage playful discovery about objects, and develop gross and fine motor skills. Enhance learning and enjoyment by using educational videos, DVDs, read along kits and music CDs. Learn more about child development and how to create an effective learning environment. Review the materials in the parent/teacher collection. Encourage independence by having your children check out their materials using their own "My First Library Card," available at the check-out counter. For your convenience, the Youth Services Room has check-out machines at the information desk. Say hello to the librarians. We want your children to be comfortable coming to us with their questions. Librarians are always available to help you and your child find information in the library as well as to point out important resources within the community. With every visit to the library, your child can reinforce or expand reading and thinking skills, which leads to even greater learning. Bringing your child to the library results in wonderful learning opportunities - and great childhood memories. Come to the West Bloomfield Township Public Library often!